(February 9, 2017) - A sticky-fingered thief's fingers failed him when he tried stealing a large potted plant and wound up dropping and breaking it instead. The Cape Coral Police Department is seeking the public's help in identifying this suspect. At around 10am on Sunday, January 29, 2017, the business of Hand Therapy of Cape Coral, located at 3636 Del Prado Boulevard South, was a victim of an attempted theft and property damage. A Chevrolet pick-up truck, possibly with rear windshield decals, backed up to the business; a male suspect got out, grabbed a large pottery pot from the front of the business and attempted to load it into the back of his truck. In the process of loading the pot, the male lost his grip and the pot smashed on the pavement in front of the business. The cost of the flower pot was approximately $318.00. 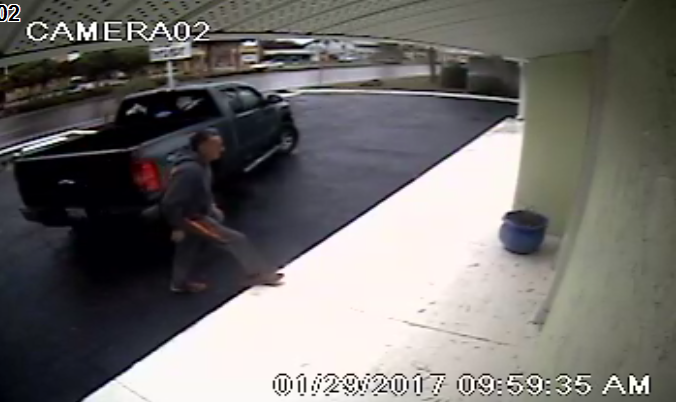 Anyone with information on this case or the identity of the flower pot thief is asked to contact the Cape Coral Police Department at (239) 574-3223.